“ ” is the symbol for a contradictory sentence. If this were all there was to the Yablo Paradox—just another example of a semantic paradox that can be generated by sentences that predicate truth of themselves or of each other—then it would not be of much philosophical interest. But the Yablo Paradox has a number of properties not shared by its predecessors such as the venerated (or vilified?) Liar Paradox. In particular, the Yablo Paradox seems, at least at first glance, to show that semantic paradoxes do not require the sort of circularity found in the Liar Paradox (and usually taken to be a necessary condition for the presence of such paradoxes, at least until 1993). This article carefully examines a number of aspects of the Yablo Paradox, including whether the paradox involves circularity in some disguised form, as is claimed by Graham Priest (Priest 1997) amongst others. In addition, we shall look carefully at the rather special sense in which the Yablo Paradox is paradoxical, and we shall also examine various ways that the infinitely descending structure of the Yablo Paradox can be generalized to arrive at other, at least apparently non-circular, versions of well-known paradoxes. Yablo himself did not, at the time, attach much importance to the paradox, since it did not seem to present any new technical difficulties for the two front-running formal theories of truth at the time: Kripke’s approach sketched in “Outline of a Theory of Truth” (Kripke 1975) and the Gupta/Herzberger revision theory given in Gupta’s “Truth and Paradox” (Gupta 1982) and Herzberger’s “Notes on Naïve Semantics” (Herzberger 1982a) and “Naïve Semantics and the Liar Paradox” (Herzberger 1982b). Nevertheless, due in part to prodding by Kripke (for more on Kripke’s involvement, see (Cook 2014), Chapter 1), Yablo eventually realized that the paradox presented a serious philosophical challenge to any account (including, arguably, both the Kripke and the Gupta/Herzberger approaches) that diagnosed semantic paradoxes in terms of circularity, regardless of whether the formal apparatus built upon that philosophical account handled the Yablo construction adequately as a matter of ‘logical luck’. As a result, Yablo published a short standalone version of the paradox (Yablo 1993), and the cottage industry of work on this puzzle immediately began to boom. Importantly, Kripke is not considering an infinitely descending sequence of sentences within a single language with a single truth predicate—that is, he is not asking about the construction at issue in the Yablo paradox proper—but is instead wondering whether similar non-circular paradoxes can be constructed within an infinitely descending sequence of Tarskian-style metalanguages, each of which contains a truth predicate for the language ‘below’ it. An affirmative answer to this distinct, but obviously intimately related question was provided by Albert Visser, independently of Yablo’s work, in “Semantics and the Liar Paradox” (Visser 2002), which was originally published in 1989 (after Yablo’s original version, but before the well-known 1993 publication of it). Are the semantic and set-theoretic paradoxes circularity-based? This has been for a long time the dominant view. It shows up in the frequently heard claims that one sure way to avoid the semantic paradoxes is to insist with Tarski on a rigid separation of object language from meta-language, and one sure way to avoid the set theoretic paradoxes is to insist with Russell on a rigid hierarchy of types. In short, the Yablo Paradox highlights the fact that accounts of, or solutions to, the semantic paradoxes cannot make do merely with ruling out (either philosophically or mathematically) problematic circular constructions. In addition, any such account must rule out, or at least account for, the similar puzzles that arise due to infinitely descending non-circular constructions. The standard formulation of the Tarskian account, with its insistence that a rigid object-language/metalanguage distinction eliminates semantic paradoxes, is but one of many targets, since it is susceptible to Yablo-style (better: Kripke/Visser-style) constructions unless supplemented with the requirement that the hierarchy of metalanguages is itself grounded. This concludes our tour of the origins, and initial importance, of the Yablo Paradox. But much of this is, as is often the case in philosophy, more complicated, and more controversial than it initially appears to be. In particular, both the claim that the Yablo Paradox is genuinely non-circular, and the claim that it is a paradox in the first place (at least, in the same sense that the Liar Paradox is a paradox) can and have been challenged. In the next two sections we shall examine these claims, and we shall then, in § 4, see how to construct a truly non-circular paradox. Before doing so, it is worth noting that we shall concentrate on Yablo’s version of the paradox, rather than on the Kripke/Visser variant, since Yablo’s version is both simpler and more well-known. All of the points made below can be reformulated so that they apply to the Kripke/Visser construction, however. Begins with premises that seem uncontroversially true. Proceeds via reasoning that seems uncontroversially valid. Arrives at a conclusion that is a contradiction, is false, or is otherwise absurd, inappropriate, or unacceptable. Given this understanding of the nature of paradoxes, it seems like the Yablo Paradox is a paradigm instance; after all, doesn’t the argument given in the introduction of this essay amount to a proof of an absurdity (a contradiction, even) based on premises that seem uncontroversially true (or, at the very least, would seem uncontroversially true, did we not already have doubts about truth stemming from the earlier Liar paradox), and using reasoning that seems uncontroversially valid? Well, “yes” and “no”. While that informal argument does show something, it doesn’t show that we can derive a contradiction, within standard first-order logic, from the infinite collection of sentences that are presumably meant to be the source of the paradox—the derivation given above ‘slips’ in additional resources that are worth identifying and assessing a bit more carefully. is a theorem of arithmetic. Theorem 2.1. , plus the infinite list of instances of , is consistent. Proof: See (Ketland 2005) for the proof, and (Ketland 2004) and (Cook 2014) for further discussion. Theorem 2.2. , plus the infinite list of instances of , is consistent. The second theorem is of particular interest in the present context, since it tells us that, even in the presence of the relatively strong , we cannot prove a contradiction from the infinite sequence of sentences involved in the Yablo Paradox—at least, we cannot do so within first-order arithmetic supplemented with our binary satisfaction predicate “ ”. But, we might ask, what prevents us from doing so? In particular, what prevents the somewhat more informal derivation given in the introduction from being carried out within first-order arithmetic? Adding this rule to first-order arithmetic results in a much stronger (and in fact complete) system of arithmetic, however, and thus far outstrips the resources of standard first-order logic and first-order arithmetic. In short, the reasoning used in the informal derivation of a contradiction presupposes that we are reasoning unambiguously about the standard, intended model of arithmetic (something ruled out by the Löwenheim-Skolem theorem in first-order contexts). As a result, we now have a better understanding of what, exactly, is involved in the Yablo Paradox, at least if the paradox is a genuine paradox in the sense of the term used in the passage from (Cook 2012) cited above. Either (i) the paradox involves, not merely the infinite sequence of sentences as originally supposed, but the universal generalization that provides this sequence as its instances—that is, the —plus the similarly generalized (rather than merely its instances), or (ii) the paradox involves deductive resources beyond those found in standard first-order arithmetic (even though each of the infinite sequence of sentences involved in the paradox is formulable in the standard language of first-order arithmetic, supplemented with a binary satisfaction predicate. Either way, the infinitary nature of the Yablo Paradox involves notions that go beyond what is required for its finitary, circular cousins such as the Liar Paradox. Our next task is to examine the claim that the Yablo paradox is, in fact, a genuinely non-circular paradox, and thus provides a new species of paradox distinct from paradoxes involving circularity in an essential way, such as the Liar paradox. Although the informal discussion of the Yablo paradox seems to make its non-circularity evident—after all, each sentence only ‘says’ something about sentences below it in the list—we have already seen evidence that a merely informal treatment of the paradox in question can be misleading (for example, in terms of exactly what is required to generate a contradiction). Thus, it is worth examining the claim that the Yablo paradox is genuinely non-circular in a bit more detail as well. is a theorem of . In fact, the amounts, in the end, to little more than a report of this fact (and recall that the is provable using the diagonalization lemma—that is, pure arithmetic—alone, and does not require the T-schema, the , or any other non-arithmetic resources for its proof). There seems to be little point in arguing with Priest about whether this amounts to a genuine form of circularity (since squabbling about what ‘really’ counts as circular or not threatens to obscure the real issue—understanding the roots of paradox in the first place), or whether the Yablo paradox truly ‘suffers’ from this sort of circularity (since it is a mathematical fact that it does). But there are two observations that we can make. First, Priest’s observations regarding the circularity of the Yablo paradox are part of a larger argument that all paradoxes involve circularity (or something like it—satisfaction of his inclosure schema, see (Priest 1995)) in an essential way. The problem, however, is that sentential and predicate fixed points seem too prevalent to do much explanatory work. As noted in (Leitgeb 2002), (Cook 2006), it is easy to prove that every sentence in arithmetic (and in any theory at least as strong as arithmetic) is a weak sentential fixed point of some predicate, and every unary predicate is a weak predicate fixed point of some binary predicate. As a result, although Priest’s claim that the Yablo paradox is circular, since it involves a predicate fixed point, is no doubt correct, it is not clear how useful the observation turns out to be in the end. If every predicate whatsoever in arithmetic (or in any theory at least as strong as arithmetic) is also a predicate fixed point, but the vast majority of such predicates do no give rise to paradoxes, then we are left wondering what special explanatory role this sort of circularity is meant to play in our account of the Yablo paradox. Of course, the existence of fixed points is not necessarily the only way to understand or identify the presence of circularity. For example, (Leitgeb 2002) and (Yablo 2006) explore an analysis of circular linguistic constructions in terms of the structure of corresponding non-well-founded sets (although see (Cook 2014) for a series of criticisms of the viability of any such account). This version of the Yablo paradox contains no fixed points of any sort. (See (Cook 2014) for a proof of this fact, as well as for the development of an infinitary propositional logic within which the derivation to a contradiction can be carried out. Both (Hardy 1995) and (Forster 2004) contain earlier explorations of infinitary, non-arithmetic versions of the paradox). Since the important point, of course, is not whether the exact construction Yablo had in mind is circular or not, but rather whether Yablo’s work points in the direction of a truly non-circular paradox, this construction seems to provide good evidence for the claim that there are, in fact, non-circular paradoxes. In short, Priest’s claim is that we do not, and in fact cannot, proceed via the infinitary methods in question (whether -rule or infinitary conjunction): instead, any construction of the paradox and proof of its paradoxically must rely on a uniform finitary method of construction and proof. We will not attempt to settle this issue here (although the reader is encouraged to consult the discussion of this point in (Cook 2014)). Instead, we will conclude this section by noting that Priest’s claims about the impossibility of actually applying such infinitary reasoning strategies are controversial at best. Whether or not finite human beings (or other reasoners to which we wish our logical and semantic theories to apply) can carry out the sort of countably infinite supertasks required to construct the version of the paradox involving infinite conjunctions remains an open, and controversial, question. Once we have one instance of a non-circular paradox in hand, a natural question to ask is whether, and how, the basic idea underlying the Yablo paradox can be generalized. In other words, can we construct (apparently) non-circular variants of other paradoxes, and types of paradox? The answer, of course, is “yes”! We shall not attempt to produce a catalogue of all such generalizations here, however—instead, a handful of particularly interesting examples will be examined. (Q) Some of the students behind me are now thinking an untruth. This dual version of the Yablo paradox is paradoxical in exactly the same sense as the original version (careful construction of the paradox within arithmetic, and derivation of the contradiction from the dual versions of and are left to the reader). Sorensen’s construction of this dual version of the Yablo paradox opened up two areas of research. The first was the discovery of other patterns of reference that produced paradoxes, including ‘dual’ versions of many familiar semantic paradoxes. For example, (Cook 2002) and (Cook 2004) show that, for a wide class of sentences and sets of sentences, if we replace all conjunctions with disjunctions (and vice versa) and replace all universal quantifiers with existential quantifiers (and vice versa), then the construction that results will be paradoxical if and only if the original sentence or set of sentences was. In short, the connection between Yablo’s paradox and Sorensen’s dual version is just one instance of a much wider phenomenon. The techniques and tools of directed graph theory have been invaluable in the study these patterns of paradox (for details, see (Cook 2002), (Cook 2004), (Rabern, Rabern, & Macauley 2013), and (Cook 2014)). The most important attempts to formulate such a standard, mechanical transformation of this sort are known as unwinding theorems: results which associate with any circular paradox a corresponding non-circular analogue of it—its unwinding—such that the infinitary, non-circular Yabloesque unwinding is paradoxical if and only if the original circular construction is paradoxical. The first unwinding theorems were proven in (Cook 2002) and (Cook 2004), and applied to a propositional language containing infinitary conjunction and a falsity predicate similar to the language within which we constructed the infinitary conjunction version of the Liar paradox in the previous section. Soon after, Philippe Schlenker produced a number of unwinding recipes for arithmetic supplemented with a truth predicate (see (Schlenker 2007a), (Schlenker 2007b)). These results are complex, but a few examples should suffice to get the basic idea across. Note that the open pair has two acceptable truth-value assignments (either is true and is false or is false and is true) as does the 2-Yablo chain (either the even indexed sentences are true and the odd indexed sentences are false, or the even indexed sentences are false and the odd indexed sentences are true), while both the Liar ‘triple’ and its unwinding, the 3-Yablo chain, are paradoxical. Intuitively, each of these sentences (which can be constructed within first-order Peano arithmetic, since the provability predicate “ ” is definable in arithmetic), ‘says’ that all of the sentences ‘below’ it in the list can be proven in Peano arithmetic. (Note: This derivation relies on (i) the fact that the provability predicate satisfies a version of the converse Barcan formula (lines 2–3), and (ii) Löb’s theorem (lines 5–6).) Despite this limitation, there remains much of interest, and much yet left to be discovered, in the study of unwindings. Predicate Fixed Point (Infinite) Yablo Paradox ??? In short, we have not seen a paradox that involves the conditional, rather than negation, and which also involves the sort of infinitely descending, apparently non-circular construction found in the Yablo paradox. In short, what we want is a Curry-Yablo hybrid, which we shall (following (Cook 2014) call the Yablurry paradox. This is exactly what we would expect of a Curry-Yablo hybrid—given the substitution of “ ” for , each sentence in the resulting construction ‘says’ that all sentences below it in the list are false (i.e. fail to be true). In other words, the result of substituting “ ” in for in this construction is Sorensen’s dual version of the Yablo paradox—hence the terminology Dual Yablurry paradox. There are, of course, many other generalizations or modifications of the basic Yablo pattern in the literature, and many more variants no doubt yet to be discovered. Hopefully, however, the examples above give the reader some idea of the philosophical and mathematical richness of the Yablo paradox and the puzzles and problems connected to it. There remains, of course, much work to be done. Barrio, E. (2010), “Theories of Truth without Standard Models and Yablo's Sequences", Studia Logica 96: 377-393. Beall, J. (1999), “Completing Sorensen's Menu: A Non-modal Yabloesque Curry Paradox", Mind 108: 737-739. Beall, J. (2001), “Is Yablo's Paradox Non-Circular? ", Analysis 61: 176-187. Beall, J. (ed.) (2003), Liars and Heaps, Oxford: Oxford University Press. Beall, J. (ed.) (2008a), Revenge of the Liar: New Essays on the Paradox, Oxford, Oxford University Press. Cieslinski, C. & R. Urbaniak (2013),”Gödelizing the Yablo Sequence", Journal of Philosophical Logic 42: 679-695. Childers, T. & O. Majer (eds. ), (2002), The Logica Yearbook 2002, Prague: Filosophia Press. Cook, R. (2002), “Patterns of Paradox: Paradox and Parity", in Childers and Majer (2002): 69-83. Cook, R. (2004), “Patterns of Paradox", Journal of Symbolic Logic 69: 767-774. Cook, R. (2006), “There are Non-Circular Paradoxes (but Yablo's Isn't One of Them! )", The Monist 89: 118-149. Cook, R. (2009a), “Curry, Yablo, and Duality", Analysis 69: 506-514. Cook, R. (2012), Key Concepts in Philosophy: Paradoxes, Polity Press. Cook, R. (2014), The Yablo Paradox: An Essay on Circularity, Oxford: Oxford University Press. 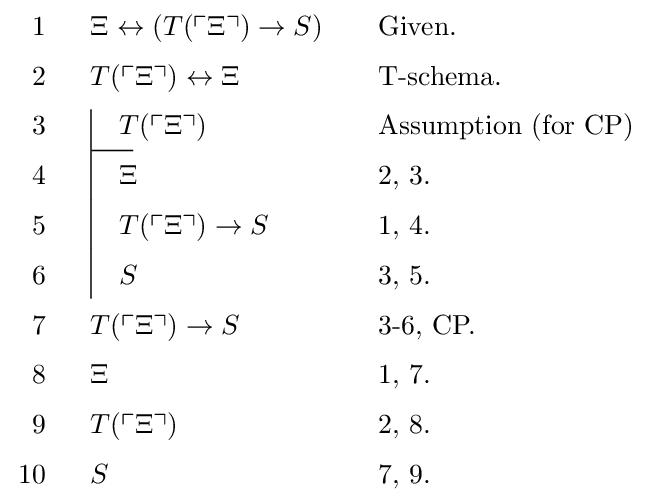 Curry, H. (1942), “The Inconsistency of Certain Formal Logics", Journal of Symbolic Logic 7: 155-117. Forster, T. (2004), “The Significance of Yablo's Paradox without Self-reference", Logique et Analyse 47: 461-462. Gabbay, D. & F. Guenthner (eds.) (2002), The Handbook of Philosophical Logic, Volume 11, Dordrecht: Kluwer Academic. Gödel, K. (1931), On Formally Undecidable Propositions of Principia Mathematica and Related Systems, New York: Dover. Gupta, A. (1982), “Truth and Paradox", Journal of Philosophical Logic 11: 1-60. Hardy, J. (1995), “Is Yablo's Paradox Liar-like?" Analysis 55: 197-198. Herzberger, H. (1982a), “Notes on Naïve Semantics", Journal of Philosophical Logic 11: 61-102. Herzberger, H. (1982b), “Naïve Semantics and the Liar Paradox", Journal of Philosophy 79: 497. Ketland, J. (2004), “Bueno & Colyvan on Yablo's Paradox", Analysis 64: 165-172. Ketland, J. (2005), “Yablo's Paradox and ω-Inconsistency", Synthese 145: 295-302. Kripke, S. (1975), “Outline of a Theory of Truth", Journal of Philosophy 72: 690-716. Leach-Krouse, G. (2014), “Yablifying the Rosser Sentence", The Journal of Philosophical Logic 43(5): 827-834. Leitgeb, H. (2002), “What is a Self-Referential Sentence? Critical Remarks on the Alleged (Non)-Circularity of Yablo's Paradox", Logique et Analyse 177: 3-14. Picollo, L. (2013), “Yablo's Paradox in Second-Order Languages: Consistency and Unsatisfability",Studia Logica 101: 601-613. Priest, G. (1995), Beyond the Limits of Thought, Cambridge: Cambridge University Press. Priest, G. (1997), “Yablo's Paradox", Analysis 57: 236-242. Rabern, L., B. Rabern, & M. Macauley (2013), “Dangerous Reference Graphs and Semantic Paradoxes", Journal of Philosophical Logic 5: 727-765. Schlenker, P. (2007a), “The Elimination of Self-Reference: Generalized Yablo Series and the Theory of Truth", Journal of Philosophical Logic 36: 251-307. Schlenker, P. (2007b), “How to Eliminate Self-Reference: A Precis", Synthese 158: 127-138. Visser, A. (2002), “Semantics and the Liar Paradox", in Gabbay and Guenthner (2002): 149-240. Yablo, S. (1985), “Truth and Reflection", Journal of Philosophical Logic 14: 297-349. Yablo, S. (1993), “Paradox without Self-Reference", Analysis 53: 251-252. Yablo, S. (2006), “Circularity and Paradox", in Bolander, Hendricks, & Pedersen (2006): 165-183.